The car shipping industry is not all that well-known – sure, plenty of people know about it, and if you stop and think about it for a little bit you can make some educated guesses about how it works. But on the whole, when compared to, say, Wal-Mart or McDonald’s, car transporters just don’t have a lot of customers. Of course, to mitigate this they have to charge you more money for their services, but one of the most-asked questions is how auto shippers determine how much they’re going to charge to transport your vehicle. The answer to this is that it depends on a number of factors. For one, where you’re shipping from. There may be thousands of different auto transporters driving car transport trucks across the United States, but there are only going to be a handful that will be moving in or out of your pickup city, and even fewer that are headed toward your delivery city. So the load has to be worth their while, and this is where the driver’s experience really comes into play: some shippers will charge on a per-mile basis, but most will actually sort of wing it in terms of how they price your shipment. Some run specific routes that they know the ins and outs of, which allows them to quickly and expertly name the price for their route because they know it so well. Others will look at fuel prices versus distance, and maybe do some research on typical traffic conditions along the route. Most all will incorporate other loads they are carrying into the route as well, which means that they may not always take the quickest way from A to B. This is part of the reason why auto transport brokers are incredibly important – they help to keep your costs reasonable. Brokers feed loads to the transporters on the road, but if they try to gouge a broker for more money all it takes is a quick phone call to a� different company (one who will take the load for less money), and all of a sudden they have one less car on their truck. 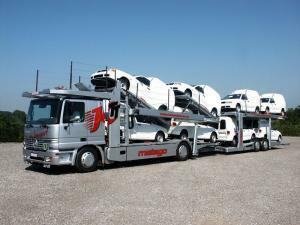 Without that middleman, though, chances are the transporter would charge you an arm and a leg, because you don’t have intimate knowledge of the auto transport industry like a broker does. It’s like mechanics charging more for parts and labor for things that don’t need to be fixed because they know the customer doesn’t know jack-all about cars. It’s the same concept, and brokers are the ones that help make sure your prices are fair and reasonable. These are just some of the things that determine your ultimate auto transport cost.